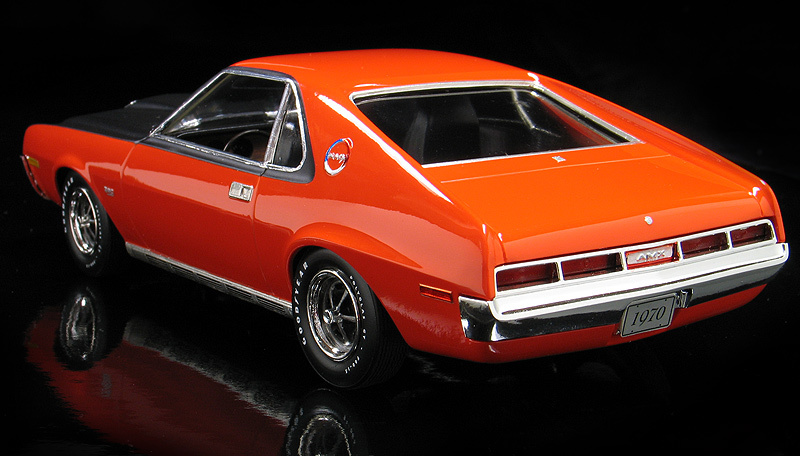 While Johan's 1969 AMC AMX kit is very common, the 1970 model year kit is very hard to find. Usually kit manufacturers updated their tooling from year to year. By that logic you would think the 1969 kit would have been altered in to the 1970 kit and the '69 kit should have been lost to time. But for some unknown reason to me, the '70 kit was never re-issued while the '69 kit stayed in production through into the 1990's. I found a complete built-up Johan 1970 AMX model back in the early '80's at a swap meet and snagged it quickly because I knew how rare it was. It then sat in my stash of to-do projects for close to two decades before I finally got around to recently rebuilding it into the model pictured. The first order of business was to the strip the original paint. An overnight bath in Super Clean Degreaser (better known as "the purple pond") revealed a very nice body with no sand or glue marks. I got lucky on this one. Lots of times a thick brush paint job can hide a really crappy body underneath, but this one was spared the harsh model building techniques of most kids back in the '70's. Next, the old dull chrome parts were stripped and then sent to Chrome-Tech USA for re-plating. They came back better then new. Body prep consisted of filling in some minor sink marks with body filler. Then I sprayed on a new coat of Testors GM Hugger Orange lacquer. After studying photos and paint chip charts, I determined this was a pretty close match for AMC's factory color called "Big Bad Orange". The orange paint was then clear coated with PPG Concept 2000 Urethane clear. 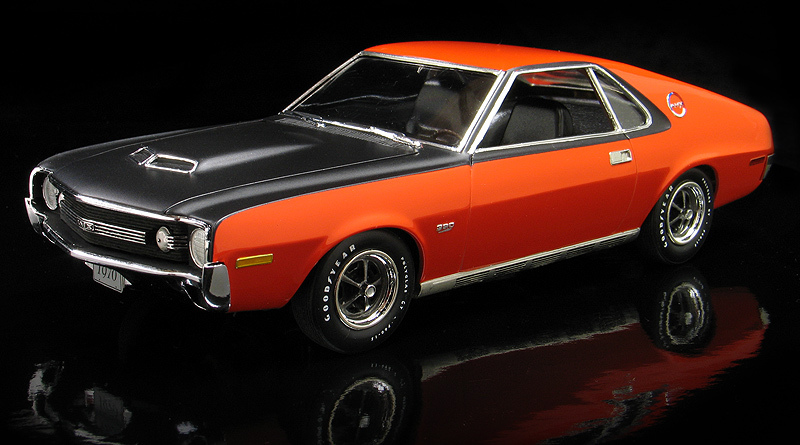 Then it was masked and the hood and window sides were sprayed with flat black which replicates a rare factory American Motors Corporation paint option called a "shadow mask." 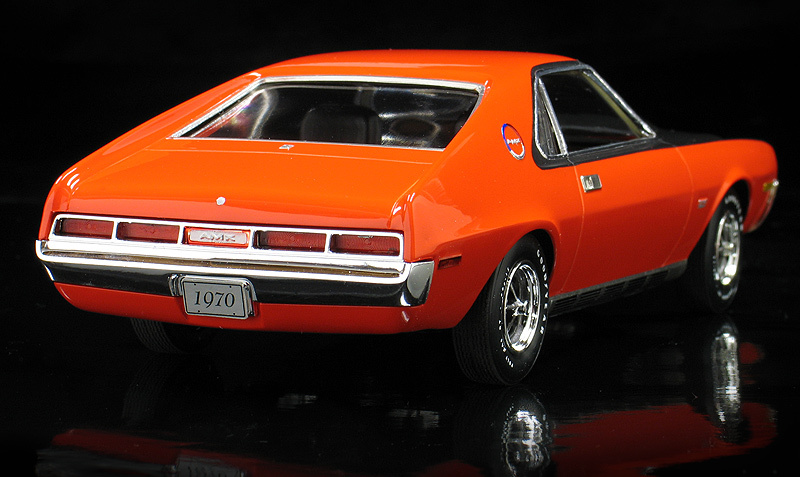 I wanted my AMX to have a correct set of vintage white letter Goodyear Polyglass GT tires. 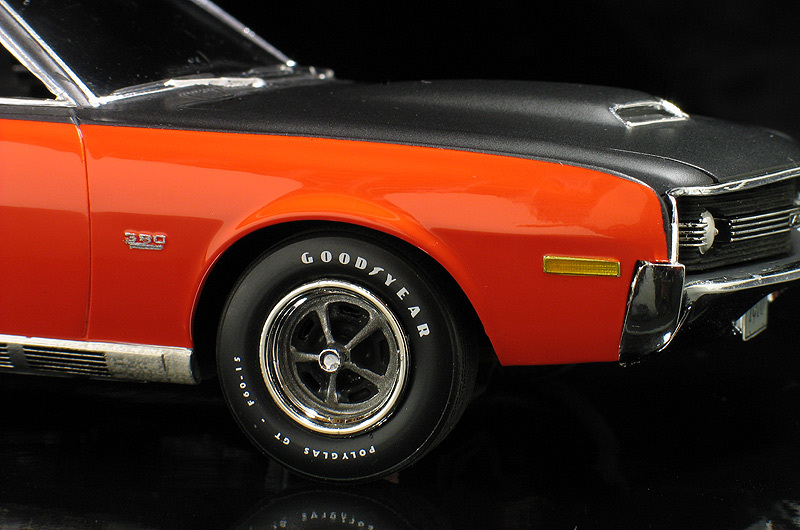 For the tires I used a set from a Revell '69 Charger kit, but these are molded with a blank side wall, so I created my own artwork and then had dry transfers made of the tire lettering. The rest of the model was built pretty much straight from the box. The license plates came from the Model King '70 Buick kit. 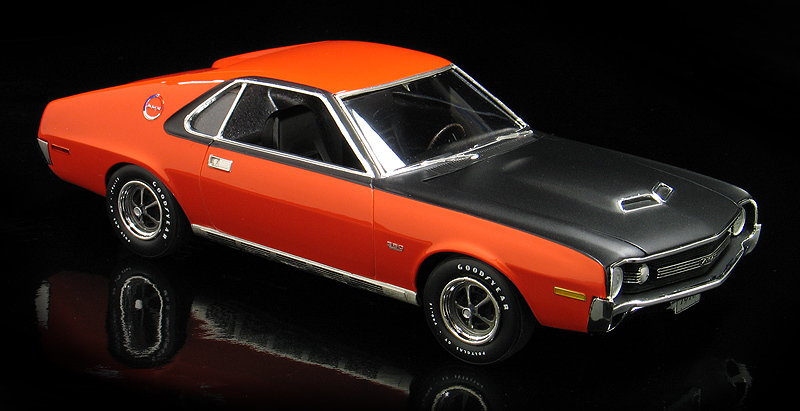 The "shadow mask" optioned '70 AMX is a very unique chapter in AMC's history and this Johan 1970 AMX is rare in model car history. 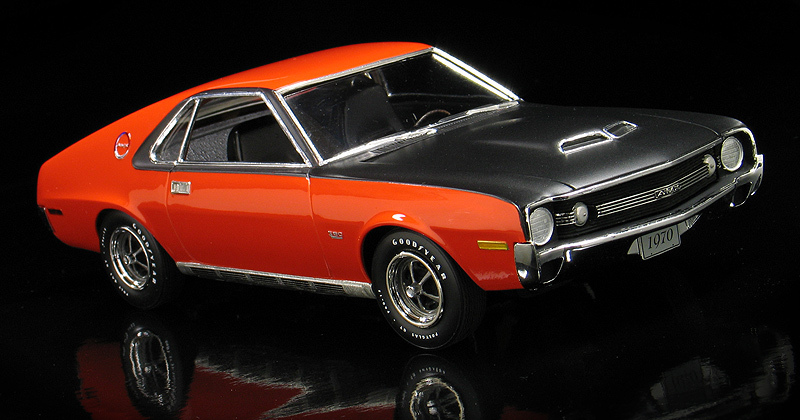 I was very happy to be able to add this piece to my collection of scale muscle cars.